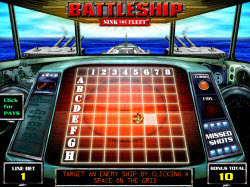 Blast your way into major winnings with a challenging game of “Battleship” slots. This is a five reel and twenty-five payline game offering a wild and scatter symbol, but also an entire fleet of bonus games and features too. The coin values for the game vary from one cent to five dollars each and this means the game is a good choice for adventurous beginners or enthusiastic pros. The exciting theme for this game is accurately depicted using icons and symbols such as the sonar, battleship, carrier, destroyer, frigate, submarine and the familiar A, K, Q, J, 10 and 9 icons also. 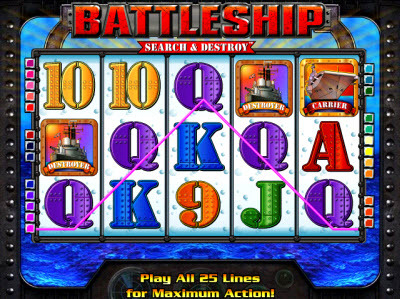 The wild symbol for the “Battleship” slots game is the trademark logo, and this is a “stacking” wild that will substitute itself for any other symbol except the scatter, and it can also fill in three positions on the same reel. The key to taking a wild combination is that the wild symbol must hit the activated payline to make the completion. 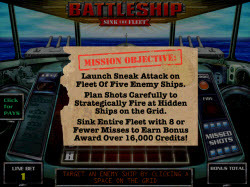 This game also offers a scatter symbol, which is the “Battleship Bonus” icon. This image will also substitute to make winning combinations, but it doesn’t have to appear along the active payline to count. This symbol does need to run in consecutive order from left to right in order to qualify. When it is four symbols along the activated payline the player gets two hundred fifty coins for the logo, one hundred fifty for the carrier or the destroyer, one hundred for the frigate or submarine, fifty for the Ace or King, thirty for the Queen or Jack, and twenty for the 10 or the 9. Three matching icons will deliver fifty coins in the amount wagered for the logo, thirty for the carrier or the destroyer, twenty for the frigate or submarine, fifteen for the Ace or King, ten for the Queen or Jack, and five for the 10 or the 9. Prizes for the “Battleship” slots game will depend entirely on the number of matching icons that fall along the payline. When it is five, the prizes are five thousand coins for the logo, seven hundred and fifty for the carrier or the destroyer, five hundred for the frigate or submarine, two hundred for the Ace or King, one hundred fifty for the Queen or Jack, and one hundred for the 10 or the 9.